Paul and Evelyn (Arnott) Orr recently celebrated their 70th wedding anniversary. They were united in marriage by Paul’s father, the Rev. John Wesley Orr, at the Greenfield United Methodist church on June 6, 1948. The couple have been active in the community with Paul serving the full gamut of church, educational and coaching roles. They thank those who sent cards and offered well wishes. The Orrs are the parents of Paula Orr (Howard Zody), Jamie Eselgroth (Charlie), Jim Orr (Rogie) and John Orr (Amy). They have eight grandchildren and one great-grandson. Paul celebrated his 95th birthday on Sunday, July, 8 with joyful family members in attendance. 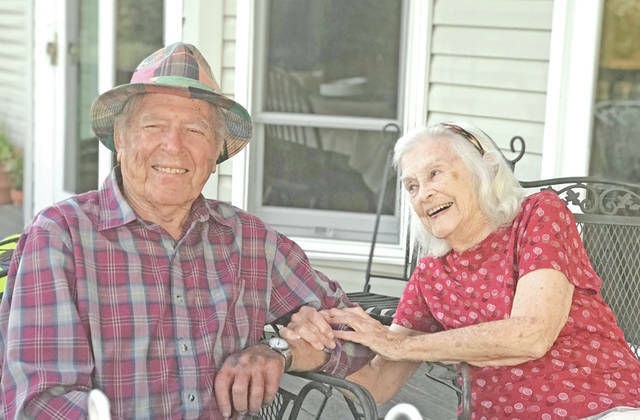 Evelyn will celebrate her 93rd birthday on Aug. 26.
https://www.timesgazette.com/wp-content/uploads/sites/33/2018/07/web1_Orr-70th-pic.jpgPaul and Evelyn (Arnott) Orr recently celebrated their 70th wedding anniversary. They were united in marriage by Paul’s father, the Rev. John Wesley Orr, at the Greenfield United Methodist church on June 6, 1948. The couple have been active in the community with Paul serving the full gamut of church, educational and coaching roles. They thank those who sent cards and offered well wishes. The Orrs are the parents of Paula Orr (Howard Zody), Jamie Eselgroth (Charlie), Jim Orr (Rogie) and John Orr (Amy). They have eight grandchildren and one great-grandson. Paul celebrated his 95th birthday on Sunday, July, 8 with joyful family members in attendance. Evelyn will celebrate her 93rd birthday on Aug. 26.